Málaga, through its provincial council, has taken an important step in the promotion and projection of the Camino de Santiago in Andalucian lands and it is already concluded the signaling of the eight sections of the Mozarabic Path that cross the province. The route, presented Tuesday in Antequera, has been approved as GR-245, includes signs throughout its route, as well as information panels. The Mozarabic route that crosses the province crosses the towns of Almogía, Villanueva de la Concepción, Antequera, Villanueva de Algaidas and Cuevas Bajas, starting from Malaga capital, whose signaling is in charge of the city council. 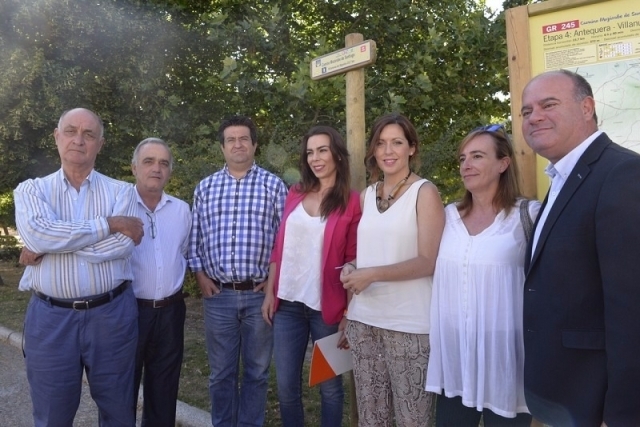 In the presentation of the route, Deputy Minister of Environment and Promotion of the Territory, Marina Bravo, recalled that pilgrims can enjoy "all the guarantees to be orientated and with the possibility of using the shelters with which the municipalities of Málaga through which the route". The Mozarabic Way is one of the most historically and culturally interesting routes along the Way of Saint James in the Iberian Peninsula, with first pilgrimages dating back to the times of Christians living in Al-Ándalus (Mozarabic) and traveling to Santiago Of Compostela. In the last decades, thanks to the associations of friends of the Camino de Santiago and Andalusian public administrations, work is being done to equip the group of Mozarabic routes with the necessary resources, correctly marking the routes and informing the pilgrims.